Home / News / Unbelievable / Viral / WATCH: Horrifying Footage Shows Missing Farmer’s Body Intact Inside a 7-Meter-Long Python! 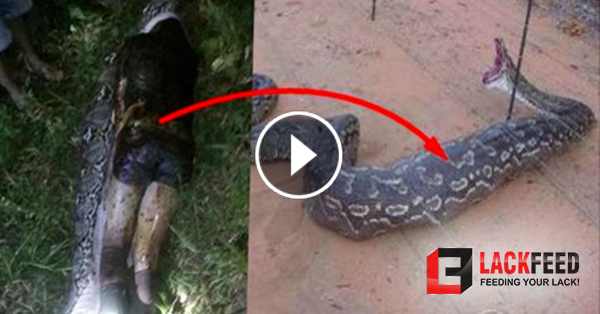 WATCH: Horrifying Footage Shows Missing Farmer’s Body Intact Inside a 7-Meter-Long Python! He set out to harvest palm oil, but he never returned home. 25-year-old Akbar Salubiro set off to gather palm oil in his remote village on the island of West Sulawesi, Indonesia. But neighbors noticed that he didn’t return home after. They soon found out that he was missing the following day. Neighbor Satriawan – who knew Akbar – said: ‘He was found in the location of the garden. ‘When the snake was captured, the boots Akbar was wearing were clearly visible on the stomach of the snake. According to Wikipedia, the reticulated python is a species of python found in Southeast Asia. They are the world’s longest snakes and longest reptiles and among the three heaviest snakes. They are boa constrictors that suffocate their victims before swallowing them whole.